1. Mix the crab with the ginger, chilli, coriander, red onion, avocado, tomato, lemon juice and seasoning. Stir in 50g of the breadcrumbs and bind the mixture with the egg yolk. Using floured hands, shape into 16 equal cakes. 2. Dip the cakes into seasoned flour then into beaten egg and finally into breadcrumbs to coat completely. Chill until needed. 3. 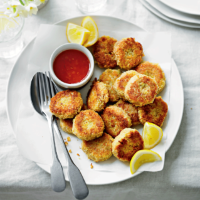 Heat the oil in a frying pan and cook the crab cakes on both sides until golden and crisp. Serve with the chilli sauce for dipping.